This is the campaign log for the Twenty Fifth session of a google+run Wandering Heroes of Ogre Gate campaign. The previous session is described HERE. Xiu: A former member of Purple Cavern sect and current disciple of Bone Breaker. The party remained at their outpost in the former Mystic Sword Temple headquarters, re-organizing Bone Breaker sect. They made San and Bone Breaker joint 1st Chiefs, with Jade Priestess taking the position of 2nd Chief. Chen was appointed Sect Physician (in reality poisoner) and the Master of Zhe Valley (Gentle Demon) was given the position Divine Representative (which allowed him to continue heading his own sect but also serve as a member of Bone Breaking Sect). Other members were divided into Senior Disciples, Junior Disciples and Initiates. They decided to go to Red Mountain Villa to take the Phoenix Crown. Leaving Yang Tuo and Abbot Ping behind to take care of Bone Breaker's wife (who was pregnant) they discussed their strategy and marched out (Lady Plum Blossom went with them as well). When they arrived at Red Mountain villa, they found Compassionate Monkey who told them they could not enter. Bone Breaker asked to speak to one of the immortals and eventually Ji came out to hear his request. Bone Breaker asked if he could have the Phoenix Crown to help unite the martial world. Ji told him this was impossible as it had been left behind by Zhi Zhu, and only she could retrieve it. Bone Breaker informed Ji that Zhi Zhu was dead. Ji asked why. Bone Breaker said "I killed her", then explained it couldn't be helped and he was turning over a new leaf, that he merely wanted the crown to help unite the sects around Perfect Heaven Lineage. Ji initially said no, but when Bone Breaker accepted this without violence, he said he would give him the Phoenix Crown if Bone Breaker called him Sifu and kowtowed three times. Bone Breaker agreed. Bone Breaker then inquired about Compassionate Monkey's Heavenly Pills. Compassionate Monkey said "You cannot have my pills!" Then he turned to Ji and said "He's lying Sifu, he's lying Sifu!". This happened a number of times where Compassionate Monkey would deny them the right to his pills, then claim they didn't exist. Finally Bone Breaker asked Ji if he could have the pills and Compassionate Monkey flew into a rage, raising his hands and bringing down a powerful force from the heavens upon everyone (including Ji). This wounded people tremendously and Compassionate Monkey immediately apologized and asked Ji's forgiveness. Ji told him to retreat into the Villa so he could speak privately with Bone Breaker. Ji said that Bone Breaker should go take the pills from Compassionate Monkey's home in Flower Fruit Cavern then return them to the villa. However he gave Bone Breaker and four others permission to take two pills. Bone Breaker thanked Ji and they returned to their headquarters. When they arrived, they learned that Little Venom (Bone Breaker's wife) had given birth to a song, who Bone Breaker named Xiao Feng. Jade Priestess also gave Xiao Feng a golden Demon Moon bracelet. After a few days the two leaders of Perfect Heaven Lineage Sect, White-Eyed Dragon and Divine Phoenix, arrived and Bone Breaker gave them the Phoenix Crown and Wind Saber of Sunan. He then invited them to remain at the headquarters while they brought sects into the fold. Chen took on two disciples: Zi Hua and Na. Of the two, Zi Hua was more hot tempered and difficult, but also demonstrated the highest level of skill. Na was less talented but more studious. They left the next day for Flower Fruit Caverns. Only Bone Breaker, Chen, San, Lady Plum Blossom and Jade Priestess went (since they didn't want others to know about the pills). Their trip was initially uneventful but it was the Demon Moon and they were ambushed by four Hopping Vampires as they moved through the forest. This was their first encounter with such creatures and they were ill prepared for it. 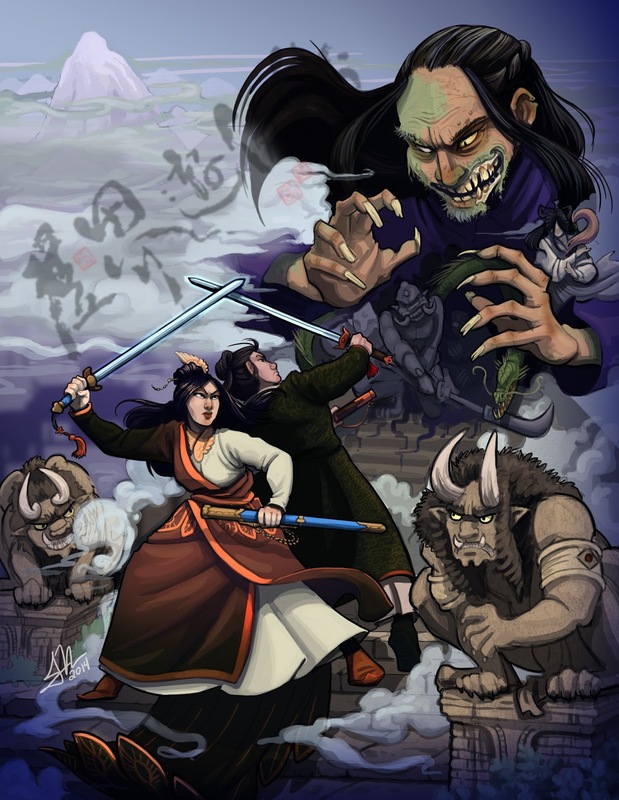 Their early attacks proved ineffectual and Chen and Lady Plum Blossom were both bitten (losing some of their Qi energy in the process). It was a grueling fight, the went on for some time. By the end, only Bone Breaker was unscathed, and Jade Priestess and Lady Plum Blossom were forced to flee. Chen just barely managed to destroy them with his Blast of the Dragon Technique (which he used several times in the encounter). When it was done they continued on deeper into Dhamma. They passed Kwam Metta, an abandoned city near the river, then Ice Mountain came into view. As they were making their way past the mountain, a large azure skinned giant stepped into view, flanked by red-robed monks. "I will have my revenge and feast on your bones," said Abbot Song.